I hadn’t seen the bees for awhile now. It being winter and actually feeling like winter, I’m like a concerned parent. Silently hoping for a day over 18 degrees, just so I can check in on them all, make sure the hive is ok. A reassuring healthy buzzing bee off on a foraging trip, that’s all I need to see. That day comes, it’s warm, it’s crazy warm and the first thing I do after ripping my too hot woollen scarf draped around my neck is scamper up the hillside (err, slight slope in the very urban backyard but who’s paying attention to those details) to see if the bees are out. They are! 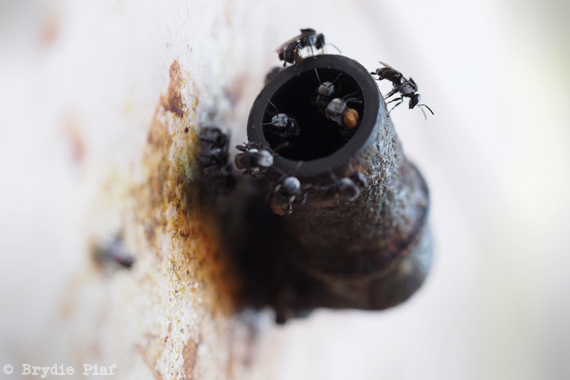 My little native stingless friends are out and about and there is rather a lot of them. In summer, first thing in the morning. I can sit outside, close my eyes, and hear a bunch of different bees and other pollinators amongst the tomato flowers. Opening my eyes I would often find a variety of different bees crowding a flower peppered plumbago. The hedge really should have been pruned back long ago but I can’t seem to do it with so many bees sourcing their daily foraging needs within the blue flower buds. It would feel a bit mean. Ever since I did a Native Stingless Bee course, bees have been a constant source of intrigue and curiosity. Not just the native stingless ones, but the whole lot of them. European honey bees, solitary bees, they really are incredibly interesting creatures. I adore this poster by Gina Cranson. 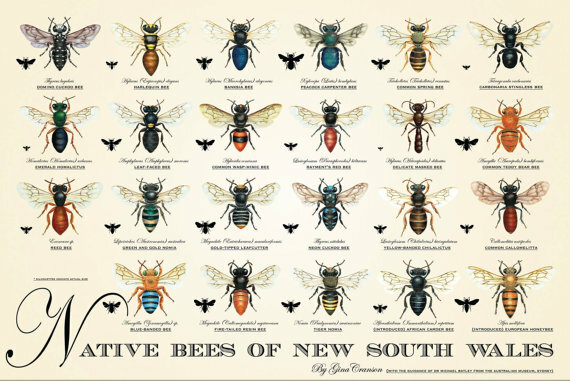 Copies of the poster can be bought through a variety of places, but you can start with her Etsy site if you are keen, (there also now available QLD versions). One of these posters sits above my desk- learning the different types just by glancing at the pictures several times a day. 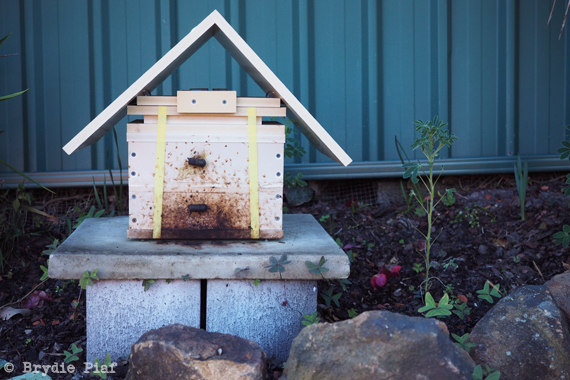 When we lived in Sydney, I had organised for our local council to fund some native stingless bee hives to set up residence within the school grounds. There were 3 when we left which opens up the possibilities for either splitting the hives and passing another on to another school or harvesting the honey. Either way it’s a wonderful lesson for school kids, and I’m hoping to do the same here at our new school. Another option for bee lovers is to host a honey bee hive. Not technically yours for keeps, but a wonderful alternative, which gives a pollinated garden and proportion of the honey as a trade off. It’s a winning system I tell you. Earth Garden magazine frequently writes on a variety of our wonderful bees. 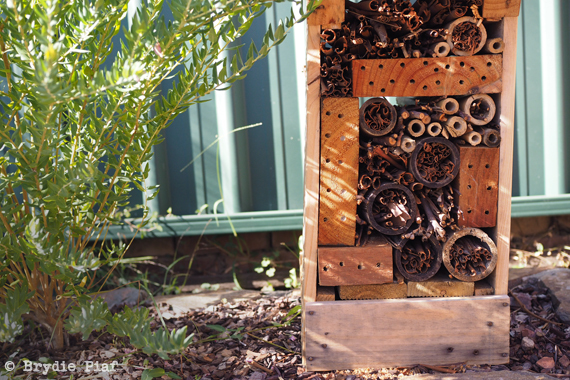 Awhile back I wrote about how to create your own Insect Hotel, over on Milkwood. Urban Hum hosts hives if you are in Newcastle, NSW. Doug Purdie from The Urban Beehive, has you covered for all things honey bee related.